Here's a look at the closet from my daughter's old bedroom. We added that window and then, ripped out everything else. 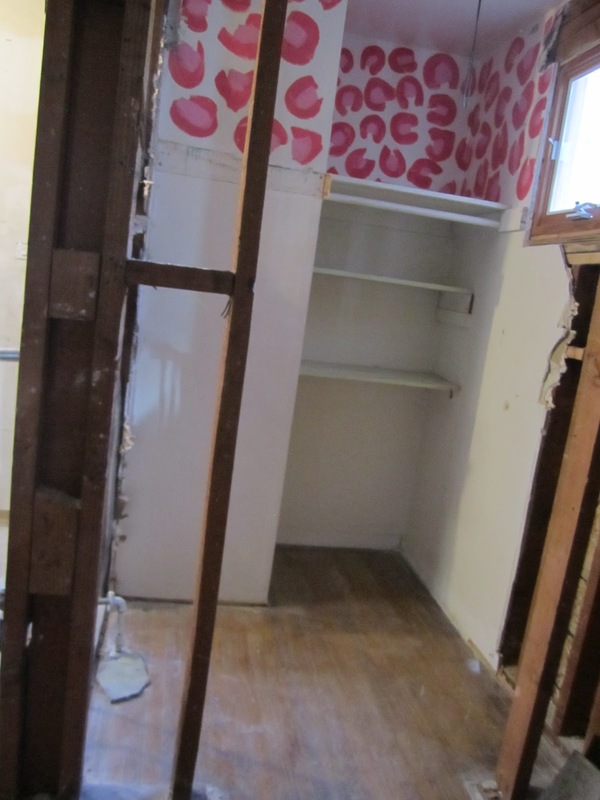 This space will basically be converted into the new water closet. We extended the house behind those shelves--and that's where the shower/tub area will be. To the left of this closet was the old laundry area. This has become the new kid's bathroom. We had planned to create a new floor out of polished concrete, but as luck would have it, we had some extra terra cotta pavers left over from the kitchen and sunroom tiling. We even eked out a few more for the water closet. 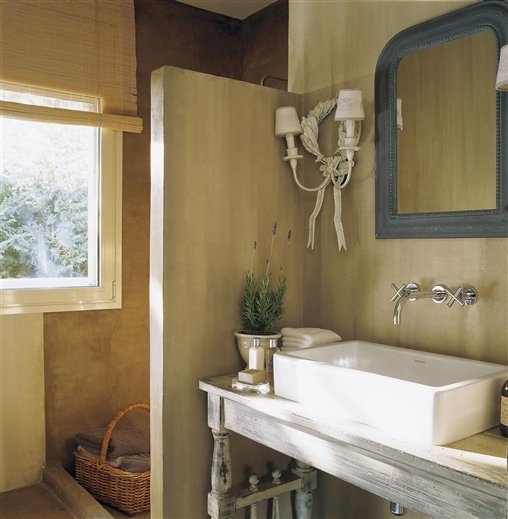 It's a more grownup look for a kids' bathroom, but we'll keep the elements organic with white plaster and rustic, earthy materials, which also means indestructible. With our swimming pool, we tend to have a lot of play dates at our house and that means a lot of wet towels, feet and bathing suits. So, our kids' bathroom has to be tough. In fact, our backyard pool and jacuzzi played a large part in how we designed this bathroom. It's right off the back steps to allow traffic straight from the jacuzzi to the bathroom (and vice versa). 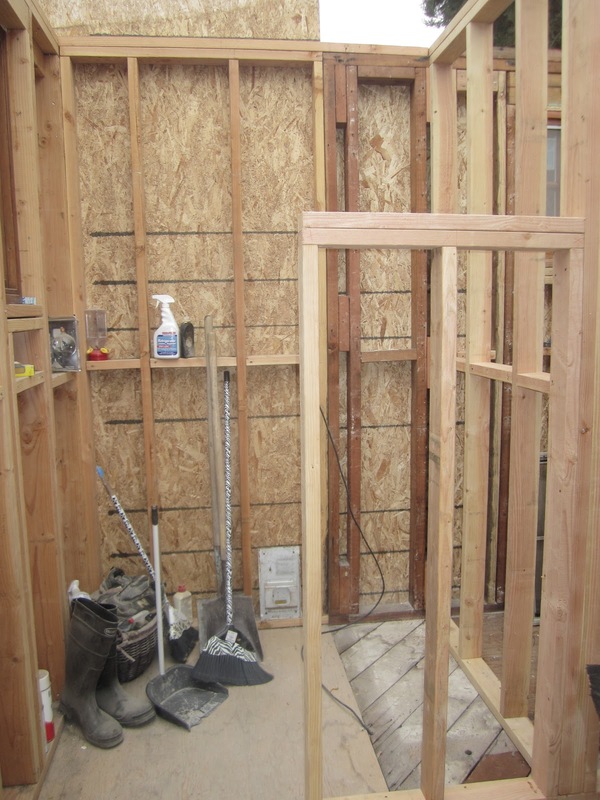 We also needed ample space for this bathroom because it's essentially a bathroom inside of a bathroom and will be used by multiple kids at one time. 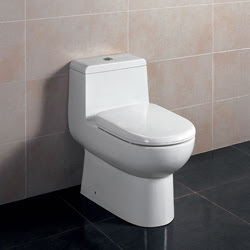 So for us, the toilet area had to be private so that the rest of the bathroom could be used or left open as a thoroughfare to the rest of the house. The shower/concrete bath tub area, which has a partial wall, is also private with hooks inside for a robe. 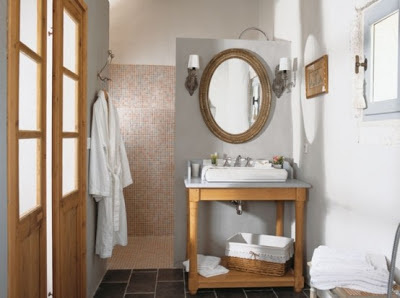 We also opted for a towel warmer because we use our jacuzzi year-round and a warm towel is the only way to muster the courage to get out of the jacuzzi on cold winter nights! 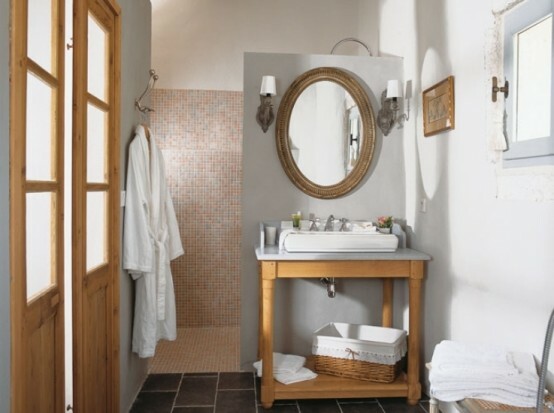 In order to finalize our design for the kids' bathroom, I looked at quite a few bathroom images on line. Here are a few pics from my inspiration file. I found that I kept returning to earthy clean bathrooms with elements of concrete, stone, wood and plaster. I love the look of the wood vanity here with the porcelain vessel sink. So pretty. Vessel sinks do have their drawbacks though. Not as easy to clean as the undermount sinks. And they seem to take up more counter space. This is a great bathroom. 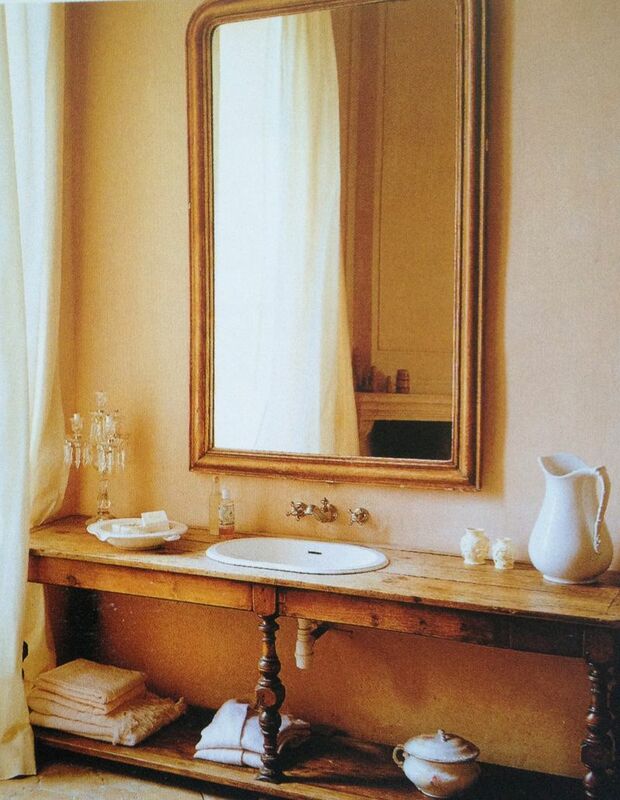 Again, a nice combo of vessel sinks with a wooden vanity that looks to be a refurbished table. This gave me the idea to split our farmhouse table in half and use it as our vanity. (The other half will become the desk top for my daughter's new room.) I would have loved to keep this farmhouse table for our dining room, but it's long and rectangular and would compete with the wood island of the same size. Too much bulky furniture filling up our open floor plan. Another nice wooden vanity. This time with a rectangular sink. I also like the wall mounted fixtures. Wow. This vanity looks like art. Beautiful. But, doesn't look like kids live here. This is one of my all-time favorite bathrooms. Those concrete floors look super tough and easy to clean. 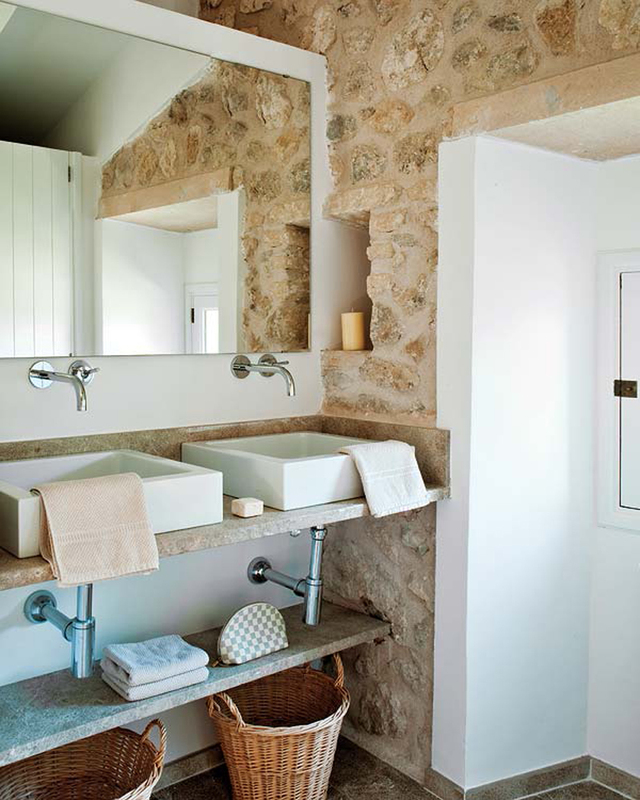 I also love the stone wall and towel warmer. Here is another great example of what you can do with concrete. Love this bath tub and the vanity with the sinks dropped right in. 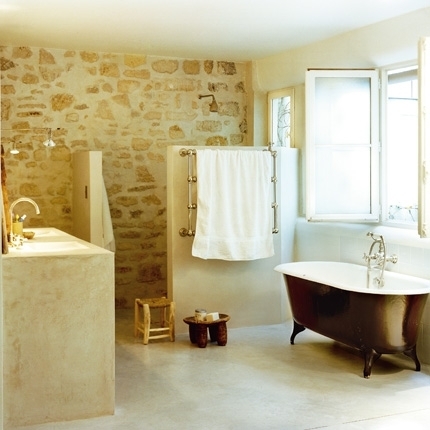 I love the French doors here and another partial wall partitioning the shower area. Very clean. Love the juxtaposition of the concrete with the crystal. 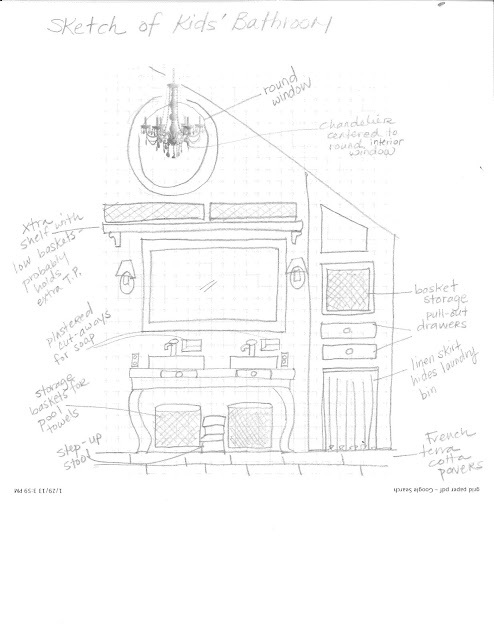 We'll have a chandelier in the kids' bathroom, too. Maybe a little grownup for our kids--but I have to have it. This is where I got the idea to do pavers in the bathroom. 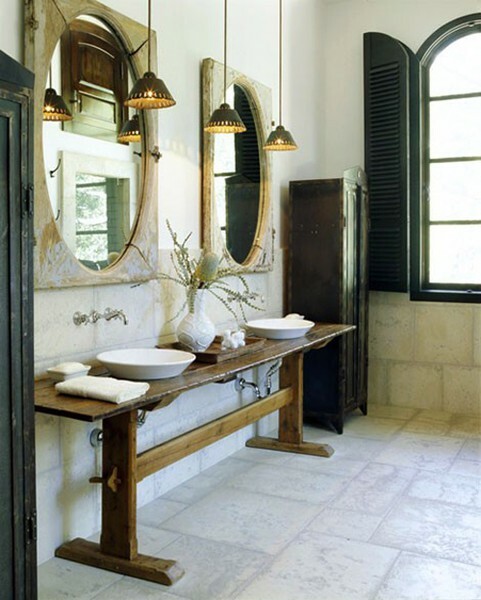 I love the rustic look of this bathroom. And the built-in closet made with a reclaimed door looks great. Don't think we have room for that chaise lounge though. Too bad. Another beautiful bathroom with a sink that's so sculptural. 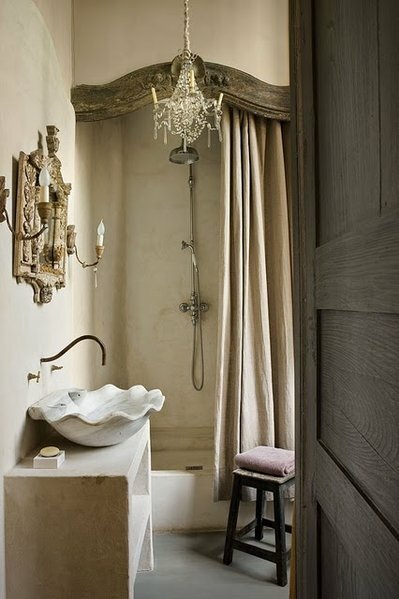 I wouldn't mind this as my master bathroom, but it doesn't have a kid-friendly vibe at all. The image to the right looks so bright and light. 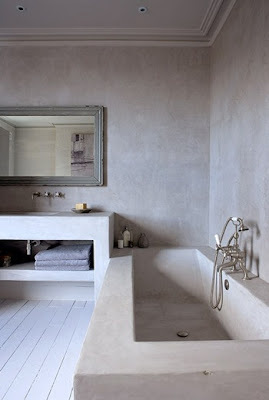 Nice concrete countertop. 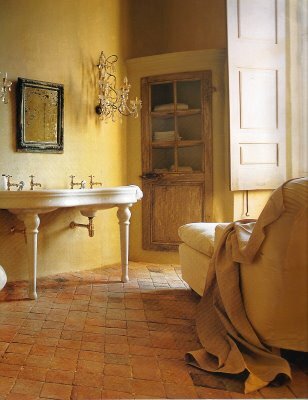 And again, terra cotta tile floor. This is a vacation home in France that is available for rent. 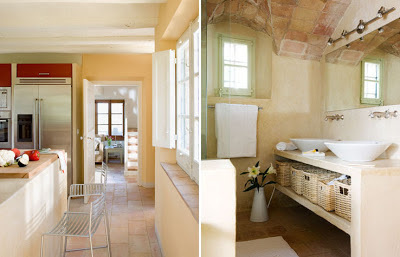 I guess I just love the feeling of being on vacation and that is just what this bathroom evokes for me. Again, clean, modern. Nice built in cabinetry. 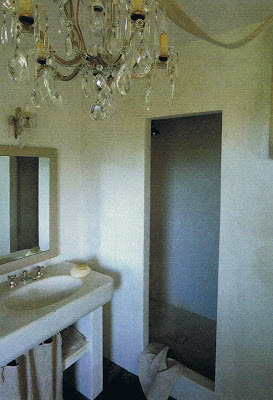 How easy would it be to make that vanity from concrete with a shelf below for bath essentials and/or towels? That ladder makes a stylish towel rack. I love this bathroom. 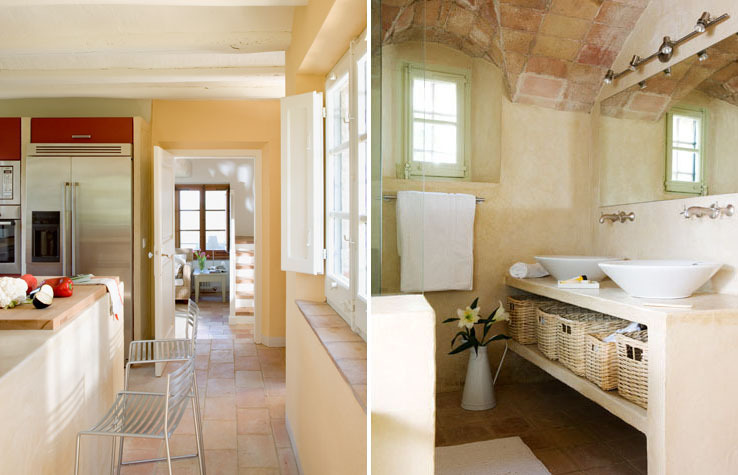 It just feels like you're on vacation in France in this bathroom. Rustic, yet functional. Are those waste baskets down below? Or laundry baskets? Not sure, but I love those, too. Here's a view of my daughter's old bedroom. Her door entered into the old kitchen/service porch/laundry area, which was not that practical and pretty cramped. 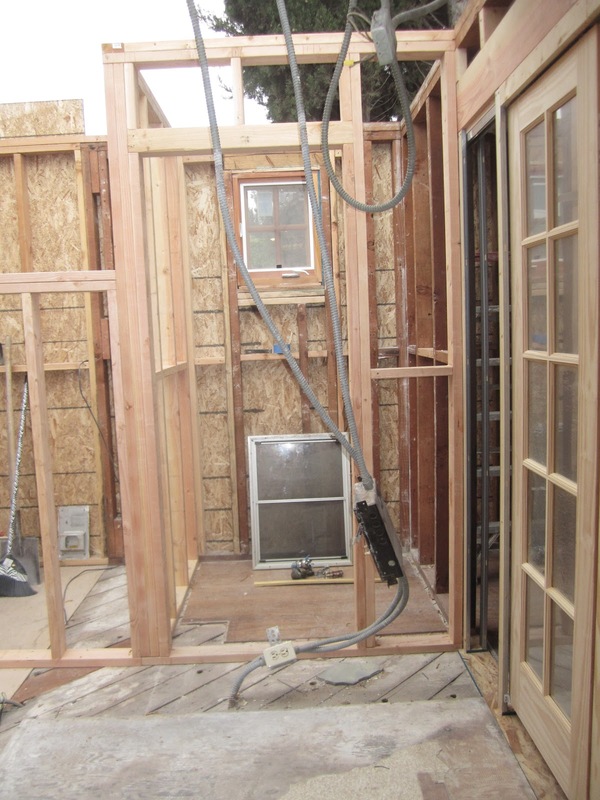 We blew out that back door and extended the back of the house to accommodate our bigger bathroom. We also added pocket French doors to lead into the new bathroom from what will now be my son's bedroom. 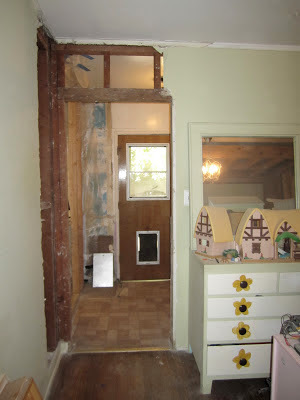 Now, you can see the walls removed and the new pocket doors that will lead into the kids' new bathroom. There are French doors just beyond these that lead to the backyard and a stone walkway leading to the pool and jacuzzi. 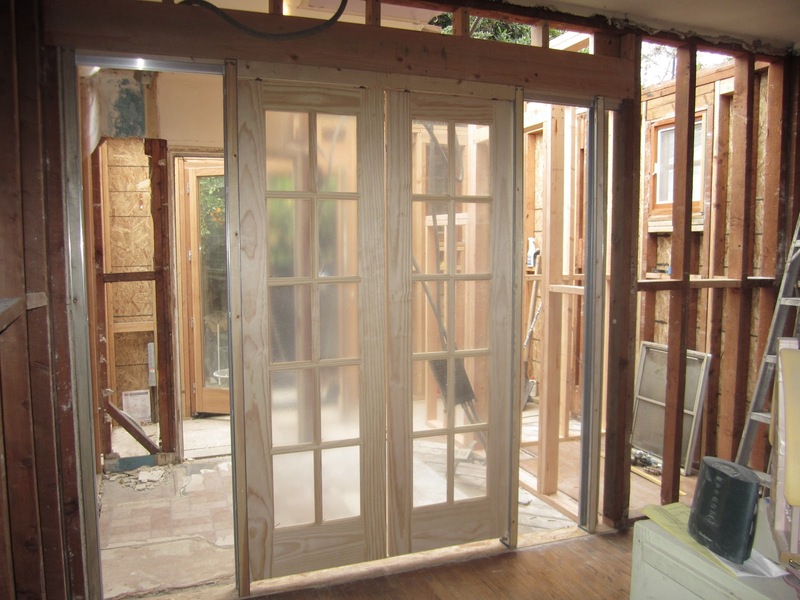 The area just inside these pocket doors and to the right is the new water closet. Behind that is the shower/tub area. Inside these doors and to the left is the dual sink vanity area. This is a view of the new shower/tub area. There's that partial wall. We also added a nice tall beam reclaimed from the old attic of our house. This is a view of the old closet now framed into the water closet. We're missing a ceiling here, too. That has been added, of course. And this room is now tiled with the pavers. Here's a sketch of the south wall of the kids' bathroom. That's our old dining room table split down the middle. 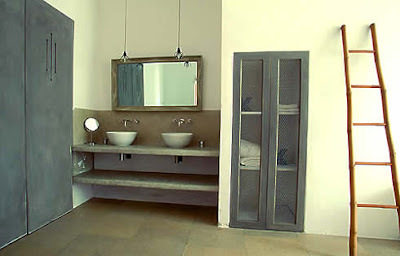 I just ordered those rectangular sinks from overstock.com. And that round window at the top is reclaimed from the front of our house. It wasn't to code for use in an exterior wall, but it works nicely here on this interior wall, which is shared with the new kitchen. It only lets light through. You can't actually see through it. The chandelier will hang centered to this round window, so you may be able to see the glow when you're in the kitchen. Another overstock.com purchase. I love the dual flush system and modern design. It should be easy to clean around the base of this toilet. Very budget-friendly rectangular sinks. 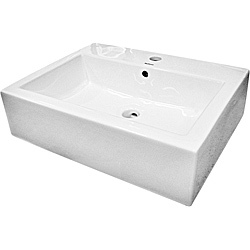 I did find a cool trough sink on Craig's list, but it was still more expensive than two of these ceramic sinks on overstock.com. We chose this faucet because it's nice and modern and doesn't require you use two hands to adjust your water temperature. Should be easier for the kids. The spout height also seemed to work perfectly with the sinks we selected. 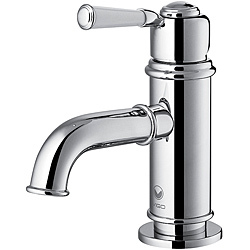 We could have gone with a faucet that was mounted behind the vessel, but we were afraid we'd have too much water splashing behind the sink all the time. 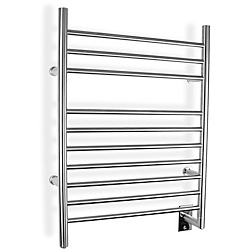 A hard-wired towel warmer. This will go on the partial shower wall. I know we could have lived without this--it was a budget-friendly splurge. But, I will make good use of this. Stay tuned. I'll post pics soon as the bathroom pieces are installed. The plumber is putting in sewage pipes this week. And the toilet just arrived today! 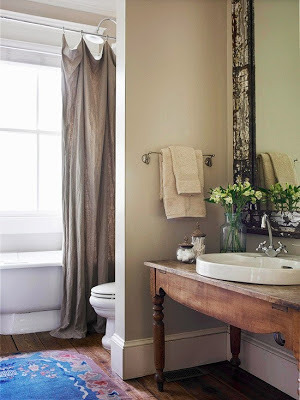 All these bathroom ideas have their unique characteristics that make them different from each other. If I were to pick one, I’d choose the one with stone wall. Anyway, how old are your kids? Maybe you can ask for their suggestions or if they have any design in mind that they want for their bathroom.